State Historical and Cultural Reserve “Tustan” was created in 1994. 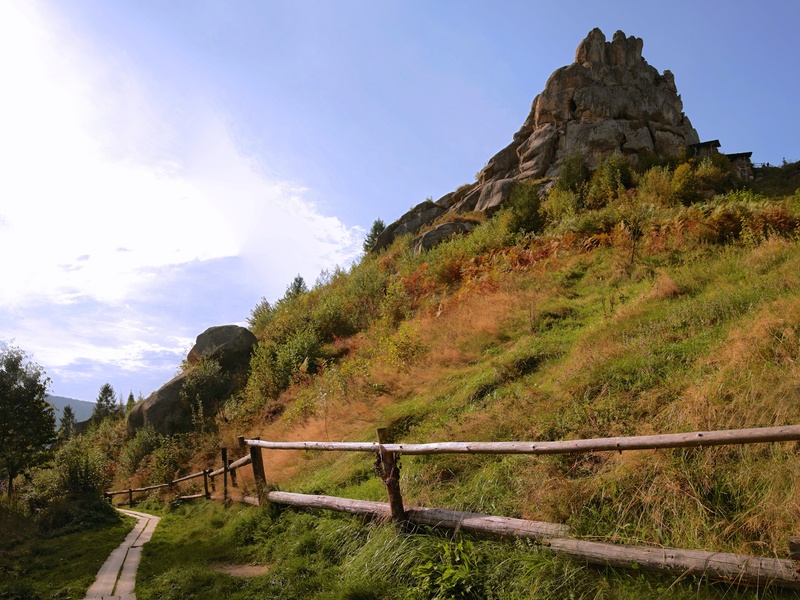 It can be considered one of the finest places in Western Ukraine. Many years ago this place was a fortress which for centuries served as a defense against the Tatar-Mongol invaders. Rock Castle Tustan - is a monument of history, archeology, architecture and nature, which is unique in Europe. Tustan unique is the ability of virtually exact replication of wooden buildings that existed on the rocks in the IX-XIII centuries - not only planning structure, but also vertical organization of the building. The fact is that builders, building an impenetrable wooden fortress on rocks were pecking in rock grooves for fixing wooden structures. Trees long gone, but traces preserved in stone. Contemporaries did not lose hope in the future to rebuild completely unique fortress. Rock fortress Tustan and general concept of rock architecture discovered to scientific world Michael Rozhko. Namely he studied the monument from 1971. October 17, 2005 was created Directorate of the State Historical and Cultural Reserve “Tustan” as a legal entity. November 16, 2005 director of the Reserve became Vasil Rozhko, son of the Tustan researcher Michael Rozhko. This is not only outstanding natural, but archaeological site. They are a consistent part of the historical and landscape complex “Tustan” as part of the national park “Skole Beskids”. Here were found the remains of walls and building structures that are remnants of ancient Rus' fortress Tustan (XI - XIII). The defenders of the fortress for a long time resisted the Tatar-Mongol invaders. In the rock caves, tunnels, wells are cut. Near the village Urich of Skole district, on the left slope of the valley of stream Urychanka in the woods rise abrupt majestic rocks up to 50 m. The rocks are erosional remnants of massive Paleocene sandstones (absolute age is 55 million years). Here are included 7 groups of rocks: Stone, Sharp Stone, Little Rock, Gutter, Gulka, Cross and one unnamed rock. 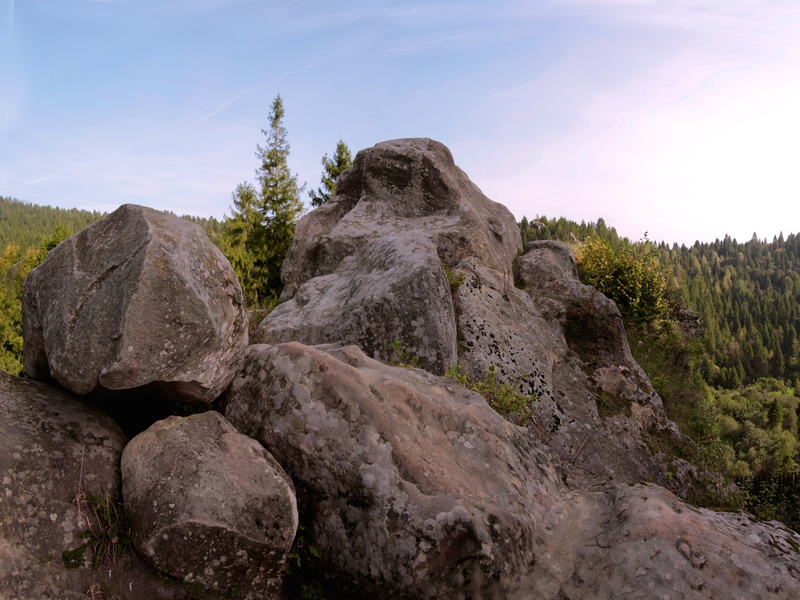 The main dominant in the landscape is the rock group Stone placed in the midst of a natural amphitheater formed by slopes of the mountains Horbysche, Old Hill, Turkiv, Tovar, Stovba, Dil, Pere-niz, Voronoviy Khrebet, Kicherka, Gorb. Stone height is 87 m above the valley. The Reserve has integrated ticket, which allows tours to visit the cave complex of stone at the Museum of Tustan History and in St. Nicholas Church: • the total price - 20 UAH. • reduced price - 10 UAH. Schedule of tours on site rocks: Daily from 10:00 to 18:00 (April-October) and from 09:30 to 17:00 (November-March). 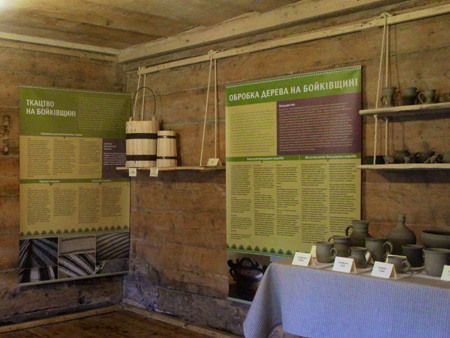 Among the objects of the reserve there is Boykyvska old house, renovated according to local traditions of construction, which has cultural center “Home in Glubokiy”. Festival of Ukrainian medieval culture which every year in August is held near architectural monuments of IX-XIII centuries, Rock fortress city Tustan. “Tu Stan!” transports visitors to the Middle Ages and creates the atmosphere of the time - except for the reconstruction of battles in festival sounds medieval music, the traditions, crafts and entertainments are recreated. 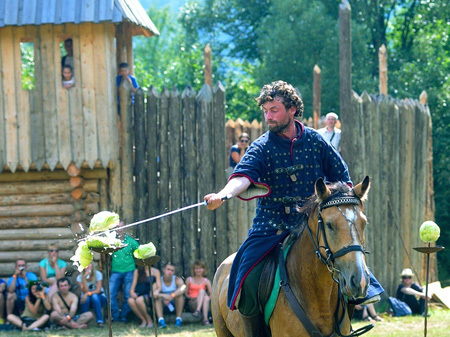 To Buhurt on the festival a single day is dedicated, besides the program “Tu Stan!” includes workshops and competitions of knights, gaming towns operate in the area. 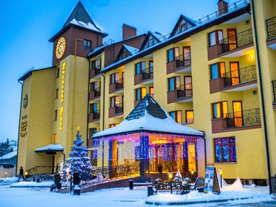 Hotel “Kyivska Rus” with medical and health functions provides the best recreation in Carpathians combined with quality and effective treatment. 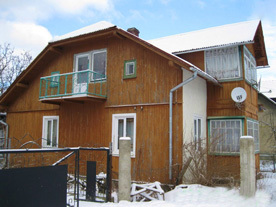 Manor “Shvagry” is located on the outskirts of the village Oryavchyk in comfortable locality on the banks of a mountain stream, among the wooded hillsides and steep rivers. Here you can really feel what is ecologically clean area. 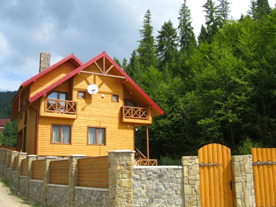 Private estate “Drymba” is located in the village resort Skhidnytsia, which is famous for its mineral springs, clean air and unique protected pine forest, 30 km from the resort Truskavets, in a picturesque valley in the north-eastern slope of the Carpathians. 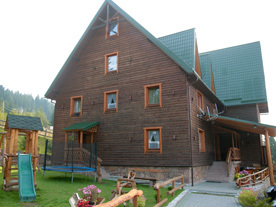 Hotel “Carpathian Riviera” is a newly built four-story wooden hotel located in Oryavchyk 150 meters from the ski resort “Zveniv” in the territory Skole Beskids. 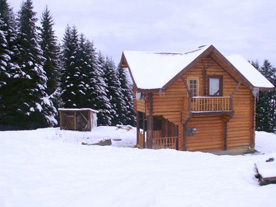 Cottage “Nad Potokom” is the new two-story house with a wooden frame, the river is called “Hemchyn” that separates the cottage from the forest. 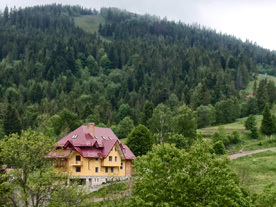 Manor “Irchyk” is surrounded by mountains that are covered with spruce-beech forests, nearby is the source of “iron” water, well with water of the “Naftusya” type. The fortress in the ninth century was founded by the tribes of White Croats. This was an important defense and customs point. Due to suitable placement the fortress rapidly became one of the centers of trade relations. Past Tustan in the ninth century passed Salt Way to transport salt from Galicia in Central Europe. This segment was also part of the transcontinental road of silk trade that passed from China to Portugal. In addition, the hail was the main border and customs center between Galicia-Volhynia and Hungary. In Tustan have been Lesya Ukrainka, John Franco, Cornylo Ustyyanovych, Antin Petrushevych, Ivan Vahylevych and many other famous people. With the twentieth century Tustan acquired patriotic values: rally of Ukrainian Youth are held here (gatherings, meetings) (in 1912, 1914). In May 1914 on the territory of rocks was held a rally-festyny of Ukrainian youth dedicated to the hundredth anniversary of the birth of Taras Shevchenko. From this time on the stones remained inscribed: “And asprse by bad enemy blood!” In 1918 after the proclamation of West Ukrainian People's Republic on the Stones lily with trident inside was engraved (after falling of West Ukrainian People's Republic in place of trident eagle appeared). Now neither one nor that are there - only niche. 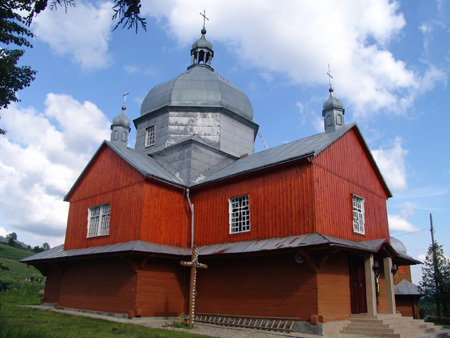 At the time of the national liberatory fighting of 1940-1950 around the Stone near the tract Pohartsi were housed kryivkas of UPA soldiers from kuren of “Boyky” named after Bohdan Khmelnytsky. In autumn of 1944 and May 1945 in the tract Tserkivne UPA fighters of kuren “Podkarpatske” were encamped. Using aerial photography and laser scanning of rocks scientists managed to create a 3D-model of Tustan that allows to mathematically introduce three-dimensional surface rocks and wooden buildings of the fortress using specialized software. 3D-models of wooden architecture Tustan were formed on the basis of image reconstructions of M. Rozhko. Conducted architectural analysis led to make them structurally stable, allowed to provide horizontal and vertical communication between scattered rocks premises, to specify a combination of wooden structures with stone, coordinate construction periods together. Also was reproduced the original appearance of the surrounding area – artificial pond, multi shafts and trenches with historic trade routes, treeless slopes. Used information technology is currently the most effective means of research of Tustan. 3D-model allows to work effectively with it as an exact replica of large and complex objects reality, virtually perform arbitrary transformations that can be destructive or impossible in the real world. 3D-model allows to explore the technical condition of the rock complexes, their carrying capacity, dynamic fracture, reproduce their original appearance. The main tasks of the State Historical and Cultural Reserve “Tustan” is taking measures for the protection and preservation of cultural heritage of rock fortress surrounding areas and moving objects, and conducting research, scientific, technical, informational, cultural and educational work for promotion of cultural heritage.